The moment you enter a cave, you have to walk a medium sized path which will lead you to the campside. The place is stunning. Extremely old trees have grown and hidden the place that the werewolves inhabited. Earth's crust is broken into pieces and surrounded by water. The only way to go from one bank to the other are the thick stems of fallen trees, which for centuries were used for bridges. In the bark of the healthy trees stood houses where members lived in. The houses that are in the highest part belong to the leaders and second in command. Raizil carefully walked the tree bridges and after picking the highest one of the houses in the trees, she let go of Jakes hand, so that she could climb the wooden ladder because she didn't really have the strength to do much else. she open the door and went straight for the bedroom at the back of the house. she set her things next to her bed and climbed into bed. "um Jake will you stay with me." She asked, her face was red as though she had been blushing deeply, but really she had a fever. She felt so cold though and she was shivering, even though the house was exactly kinda warm. "Jake is it cold in here to you?" Her speech was a little slurred. Jake obediently followed Raizil. He followed her up the ladder, a few rungs behind her. When she oppened the door, he had been looking at the trees, and got hit in the nose. "Ow." He complained. Rubbing his nose, he walked in after her. "Of course I'll stay with you." He responding, in a sort of purr. Concern bubbled in his eyes as he looked at how red she looked, and the fact she was shivering. "Are you alright? It's not cold in here." He said. He kneeled next to the bed, holding her hand. She couldn't be sick, she was a werewolf. Werewolves didn't get sick. Raizil looked up at him, her eye lids have closed. "Its not, oh. I think this whole switch of power and clan stuff is making me a little ill. I should be fine once I get some rest." She padded the empty space on the bed next to her. "I want wolfie stuffie." Was the last thing she said and thought before she passed out from the days events. 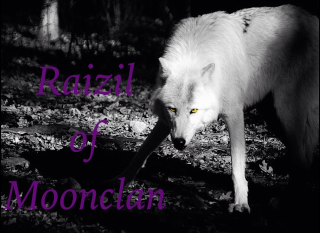 Raizil use to have a stuffed wolf that she always slept with as a child, or when she was scared it would help to comfort her. Jake frowned sadly as Railzil passed out. She wasn't in danger of getting hurt. "Wolfie Stuffie?" He whispered to himself. He decided it must be a stuffed animal, because of the stuffie part. He took a deep breath of her scent, then tried to find anything that smelled like her, something that wasn't with her. He lifted his nose into the air, searching. Jake sniffed the air, not scenting anything. He sighed, but he need to get Raizil her doll. He didn't even know why. He gently kissed her forehead, feeling her fever. The blonde boy grabbed a piece of paper, and a quill from a desk in one of the rooms and wrote her a note. I went to get you a wolf doll. I will be in town, but I would prefer you stayed in bed until you get back, ok? He left the note on the desk by her bed, then went outside, climbed down the ladder, an headed to town. Raizil stirred when she felt something touch her forehead but otherwise remained asleep. Raizil was dreaming about hunting with her family, and so she started to twitch in her sleep. But she was content. Rai tossed and turned in the bed as her dreams went from happy to a nightmare. Jake came back to the dens, traveling to his den. He climbed the ladder, entering his home. He went over to the crafting area of his house. He found a needle, and some string, and some feather from a water fowl he had caught the other day. Putting the pelt on the table, he took the feathers, and wrapped the pelt around it. He then took the needle an thread, stitching up on leg, then another, then the other two. He stuff each leg with feathers, making it really fluffy. Then he sowed up the belly, adding lot of extra feathers here. It would be a good hugging friend. After that came the tail, with feathers poked in the long way to make it stand straight out. He then sowed up the head, adding feathers delicately to make it look good. Finally, Jake had finished the stuffed wolf. It was the size of a pup, perfect size for a sleeping friend. He then took it to Raizil's den, climbing up the ladder. He opened the door, then slid into her room to find her tossing and turning in bed. He was instantly worried. He walked to her side, sitting beside it. He began shaking her lightly. She must be having a nightmare. "Raizil. Raizil wake up." He said, trying to wake her up. Raizil thrashed around in the bed and when Jake went to wake her up she thought she was still in the dream and she went to hit him. "No! Get away from me, I wont let you hurt them, you wont hurt them." She yelled as she continued her attack on her fighter. Jake clenched his teeth, trying to calm her down. He ducked his head, avoiding her punch. He grabbed her, giving her a hug. Only he wouldn't let go this time. "Shhhh, it's ok Raizil... It's ok. No one will hurt them, no one will hurt them." He said, trying to calm her down. He petted her hair, trying to help. Raizil stopped when she finally opened her eyes. IT was just Jake, she breathed a sigh of relief. "Im sorry, I seemed to have a nightmare." She pulled away from him and her eyes widened at what she saw in his hands. Her face then took on a childish cute look. "is that Wolfie Stuffie?" She asked her eyes glisening in happiness. Jake smiled as she finally fully awoke. He let her go as she pulled away. When she noticed the doll, his smile grew wider. "Yes, and its the only one of it's kind. I went to the market and got the pelt from a merchant, then I took the feathers from a goose I had hunted recently, and some thread and a needle, and made it myself. Just for you." He said before placing it in her lap. "I hope you like it." He continued, his cute, yet crooked smile appearing on his face. Raizil picked up the doll and squeezed it. She then brought it to her face and rubbed against it. "Wolfie Stuffie!" She then tackled Jake to the ground in a hug, "Thank You, Thank you,Thank you." She said smiling and hitting on him. But then her face grew murderous "Tell anyone of my Wolfie Stuffie and I will skin you alive, slowly." The last thing Rai needed was for other people to find out that she had a weakness of a homemade stuffed wolf. Not even Casper knew about this. Jake chuckled at her threat. "I'll only tell if you tell about me crying." He laughed. He didn't know what to do after she tackled him. He was tempted to lean up and kiss her, but knew it was too soon. He simply smiled at her, a caring glint in his eyes. "And you are welcome." He purred. Raizil then titled her head to the side. "Wait Jake how do you know about wolfie stuffie anyways." She was so happy that she didnt even bother to try and figure out how he knew her secret. "And I already said i wouldnt." Jake chuckled. "Before you fell asleep, you said 'Wolfie Stuffie'. So I figured you wanted a stuffed wolf doll." He explained. He gently put a hand on her hand, his grin growing a bit bigger as he looked into her pretty eyes. Raizil blushed, "Really, oh. Did I by any chance say anything else?" She wondered if she had revealed other weird things or said something. She couldnt meet his eyes because she felt so embarrassed. Jake thought for a moment, before looking back at Raizil. "When you woke up, you said 'don't hurt them!'. Who was them?" He asked, then he bit his lip. "You don't have to tell me." He quickly added. He looked at the werewolf with concern, yet there was also love in his gaze. Raizil's face instantly turned sad. "One day I woke up to the smell of smoke, so I got up to check it out and it was coming from downstairs in the kitchen. I went up to warn my parents but I found them dead in their beds. Somebody had slit their throats. I had younger twin brothers and I instantly ran to my room and grabbed the sword that my father had given to me and went to make sure they were alright. Well I saw two mounds under a blarney and I just assumed that they were alright, but when I pulled the cover back it was just bundled hay. A sack was then placed over my head and I was knocked out. When I came to I was in a cage with my brothers, we were being sold. They came for my brother and I tried to fight them off but then they took whips to me." She paused and turned her back to Jake and lifted up her shirt so that she could show him the scars that decorated her back. "You can't see them when I am a wolf because my fur covers them. Anyways I have know idea whatever happen to my brothers, I don't even know if they are alive or not. Anyways I was sold to these savage humans. I was only twelve at the time but It was the first time I felt so helpless, in the end I ended up killing them and join this nearby pack of wolves and became an assassin. Which I don't want to talk about at the time. So you see Jake I do care a lot about you I'm just scared to really commit myself, perform the bonding. How could you care for someone who has killed just for money?" Jake listened intently to her story. He gave a horrible expression when he heard about her parents and brothers. He lightly touched her cheek, then brought his mouth up to hers. He kissed her for a few seconds, then pulled back. "That's how." He replied, looking into beautiful red eyes. Raizil closed her eyes as she felt jake' slips against her own. 'He is so gentle' she thought to herself, when he pulled away. She was amazed at how he had only spoken two words but those two words said so much. She felt loved, and reassured. "You know as much as I just enjoyed that, are you sure. Because I'm going to let you know right now that if I do admit my feelings for you, I'm going to be protective, and will probably get on your nerves, but on the serious side I have many enemies that want me dead. And I can't say they won't come after you if they find out where I am and about us." Jake put her head between his two hands. "I don't care how annoying you get, or how many people try to kill us, I want to be with you. Now, and always." He said. He was tempted to kiss her again, but decided not to. Instead, he used his thumbs to gently stroke her cheeks. Raizil smiled, it warmed her heart to know that Jake still wanted to be with despite everything she told him. He truly did love and accept everything about her. But before she was going to answer him a howl could be heard. it sounded like it was coming just outside the dens in the camp clearing. "Come on Jake lets go greet our visitor.' She said and gave him a peck on the cheek before she headed down the ladder to see who it was that summoned them. Jake sighed, feeling as though she was going to say something. If he was in wolf form, his tail would be lashing with annoyance. He stood up, and followed his alpha. He wondered who the visitor could be. Jake returned to the dens, holding his new son, Kenji, in his arms. After tickling the small boy, he climbed up the ladder to Raizils den, and entered the house. His smile grew wider, and he gently placed his son on his mothers bed. He gently climbed on, then put Kenji in his lap. He gently rocked him as he waited for Rai to return.